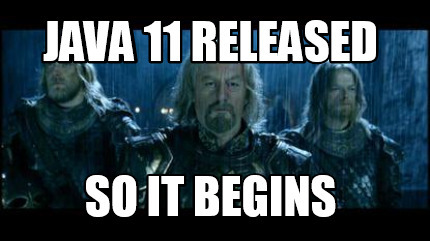 Starting with Java 11, several packages have been “hard-removed” from the JRE itself (For Java 9 and 10 they were simply re-activateable by using a parameter) – one of those being the javax.xml.bind package, which used to provide (together with others) the JAXB implementation. The JAXB packages are not available anymore – how to find them? My bundles have to run on both Java 8 and Java >8 – how to achieve this? The concrete JAXB implementation seems not to be found, because OSGi – how to fix this? You can use a maven tool like p2-maven-plugin to create a p2 repository with these requirements for later inclusion. Have a look at our own dependency repo for an example. OSGi R7 introduced the support for multi-release jars. 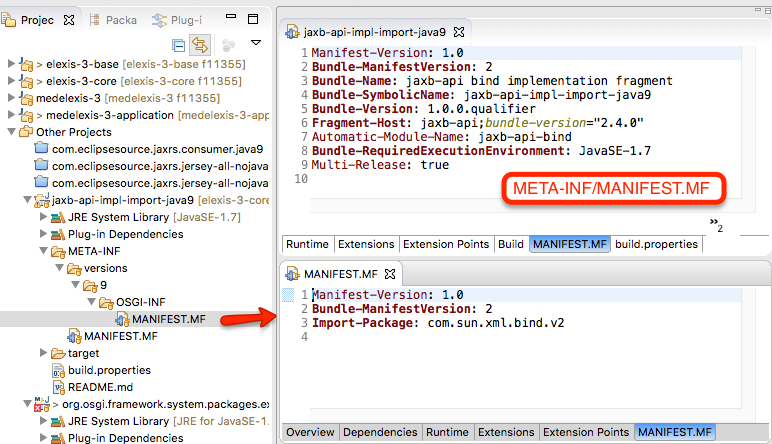 These are bundles, where, dependent on the java version you use, different manifest information is to be applied. Tycho: com.sun.source where are you? While com.sun.xml.bind.jaxb-osgi 2.4.0.b180830_0438 works fine within the IDE, when building your product trouble is on the horizon. com.sun.xml.bind.jaxb-osgi 2.4.0.b180830_0438 formally requires the packages com.sun.source.tree and com.sun.source.util which are not provided to OSGi as they are expected to be made available by the JRE. At runtime, org.eclipse.osgi_3.13.100.v20180827-1536 cares for this but at build and package time it is not satisfied. This can be fixed by providing a special fragment with Fragment-Host: system.bundle; extension:=framework which may then be included to your feature. See https://github.com/eclipse-ee4j/jaxb-api/issues/92 for the detailed problem description and http://blog.meschberger.ch/2008/10/osgi-bundles-require-classes-from.html for infos on its solution. At runtime javax.xml.bind.ContextFinder.newInstance is used to create a JAXB object that is actually performing the work. ContextFinder is part of the java-api bundle, and the actual JAXB implementation it tries to find is provided by com.sun.xml.bind.jaxb-osgi. Now in OSGi we face the problem of the classloaders per bundle being separate. In https://github.com/eclipse-ee4j/jaxb-api/issues/78 the problem of jaxb-api not able to find the real jaxb api implementation is documented. Caused by: javax.xml.bind.JAXBException: Implementation of JAXB-API has not been found on module path or classpath. 2. Provide a fragment bundle for java-api that adds the dependency to the jaxb-api implementation package. After trying the first approach, I though that I have to modify to much of the existing code – hence I moved to the second approach. The first image in this blog post actually shows this fragment. As part of a recent project I want to run mitreid connect server embedded within the Elexis-Server Neon.3 based Jetty instance (that is version 9.3.9.v20160517). Despite the excellent Jetty documentation on this version, I faced major trouble on getting to run this right. But now the real trouble started – J S P ! This is pretty much straightforward, as documented in Using JSPs. Just one thing is a little hidden – you additionally need apache aries. I could track this down and reverted to org.glassfish.web:javax.servlet.jsp.jstl-1.5.0-b03.jar to solve this. hints on what could be the problem. It breaks down to the JettyJasperInitializer#onStartup not being called and some configurations missing. Some more searches brought me to the embedded-jetty-jsp sample project where this was initialized. (I had to use the non-jetty-annotations approach, as I also use org.eclipse.gemini.naming in the container, already providing a JNDI implementation). and now it works – the journey continues! Hope this blog spares somebody else some trouble! After starting to set up an e4 based RAP application, one of the thirst things that popped into my eyes was the Windows in Windows Problem. That is, you have your browser opening the e4 rap application and you see a window title (which effectively exists for both Window and TrimmedWindow) which does not make much of a sense. For RAP based on 3.x here is the solution. For e4 based RAP it required some investigation, so here goes the solution. IObservableValue prescObs = PojoProperties.value("boolProp", Boolean.class). in your Pojo to make it work. After Eds and Eikes nice talk on Oomph at EclipseCon 2014, I decided to give it another try for our Elexis project. Turns out that its a bit tricky to come in. I found out about the correct connector kind when diving into my workspaces .metadata/.mylyn directory having a look at repositories.xml.zip. This also showed me that I have to add the attribute state=open:: in order to have fully configured task lists on the open pull requests. and install the current feature into your Eclipse Luna from https://github.com/trylimits/Eclipse-Postfix-Code-Completion. Comments always very much welcome, please use the respective github issues page. During the implementation of a new project, I want to harness the capabilities of the Eclipse application model when it comes to changes in the Eclipse context, or more accurate the de-/activation of context specific handlers. 1 is the global definition of our testCommand, 2 and 3 are perspectives in our application where for the given command a separate handler gets activated due to the context switch from perspectiveA to perspectiveB and vice-versa. 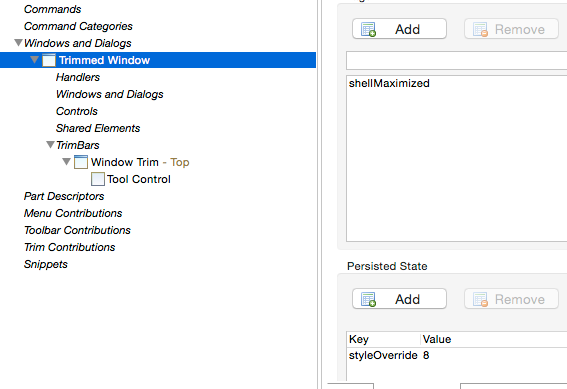 4 is the UI contribution of the command visible to the user in the top window trim. The resulting application looks like shown on the left hand side. Where the UIContribution 4 is marked with a red arrow. Now the task of the handlers is to toggle between the perspectives and update the UI contribution to either show perspectiveA or perspectiveB. As described in stackoverflow and the Eclipse forum I did not, at first, find an obvious approach to this (remark in Eclipse 3.x this could be implemented by using an IElementUpdater). After some more analysis I found a way to do so. The source for the following example is certainly available. The @Execute method does the simple task of toggling the perspective. The updating itself happens in lines 12-23. This method does listen to property changes of handler::testCommand which is the global command (see 1 in the above app model). Each time a context switch happens we get injected the current handler through Object value. So we may act accordingly. Here we act by using the modelService to find all contribution elements subsequently setting a new Label and Tooltip. If more commands and handlers are in your application you should do a more intelligent search and/or filter on the value to act correct. This approach, however, is not perfect, as you have to implement this method in both handlers in order to always be able to act upon the change. There are other feasible approaches like creating an Addon where you put the @Inject part, you would have to do this for each command separately, however. 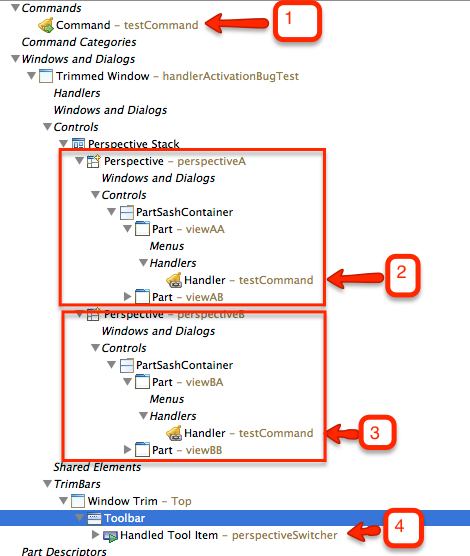 Where the injection will happen on change of the activeHandler and I also get the MCommand itself injected. This way one could also efficiently store the given UiContribution elements and limit the searches …. 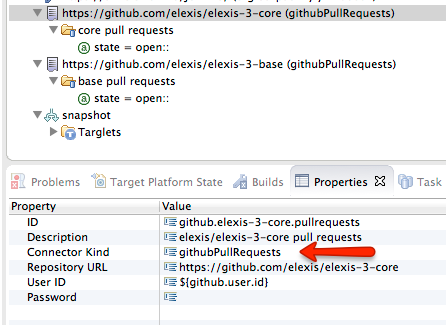 It already bothered me for some time, that one constantly seems to have Eclipse running with the wrong Java version. That is, if you’re doing heavy development you might have Java 6, 7 and 8 installed on your machine. In order to switch the main JVM Eclipse will run with you have to follow these instructions, which involves manually changing the .ini file each time you want to change the version. This is quite cumbersome, so I decided to learn some Apple Automator. With this commit the functionality to extend the Application model editor is augmented to allow for horizontal extension of its elements. So what does this mean? Lars describes in his tutorial how to vertically extend the application model, that is, how to add additional model elements and provide a respective editor for it. But what if I want additional editing capabilities to already existing model elements like e.g. the command element? The getContributableTo denotes to what model elements the editorTab will be added (this is determined as you returned Class must be instanceof). If you want to have a look at a more specific example, take a look at the Écrit implementation of the extension point.